A selection of useful recommended resources from colleagues and organisations across the country. Resources not found below may be included in the 'FAQs / Help' and 'Useful Information' sections accessed via the tabs above. Lancashire Safeguarding Boards produces a series of 7-Minute Briefings (7MB) which provide a short summary overview of a specific safeguarding topic. The briefings are immensely popular and are designed to be delivered at sessions such as staff briefings and team meetings. In line with this approach, the Safeguarding Board has produced a dedicated 7MB on Online Radicalisation with sections including: Background; Why It Matters; Information; What To Do and Questions To Consider. As the impact of the online environment becomes increasingly prevalent in online radicalisation and extremism, understanding the online safety-related aspects for children and young people is ever more important. Knowing what online safety-related resources of the vast array available are both useful and current can be a significant challenge - Lancashire Safeguarding Boards have a dedicated online safety section covering a variety of topics and audiences, including quality-assured recommended supporting resources for use in the classroom and beyond. A set of excellent classroom resources which can help to support addressing those online aspects of propaganda and extremism through Digital Literacy. The resources introduce concepts and support discussion among students so as to challenge young people to think critically about what they see online and are accompanied with both Primary and Secondary lesson plans. ACT for Youth is a freely-available collaborative resource from CTP (Counter Terrorism Policing), the PSHE Association and Girlguiding designed to teach young people how to react if caught up in a gun or knife terror attack. The resources include an animated film which can be delivered as part of a comprehensive practitioner pack with guidance notes and age-appropriate lesson plans for Key Stage 3 and Key Stage 4. The resources are focussed around the ‘RUN, HIDE, TELL’ theme, extended to include ‘TREAT’ with guidance notes, lesson plans and powerpoint resources from St John Ambulance on administering First Aid. Written and developed by the Association for Citizenship Teaching (ACT), Middlesex University and the English Speaking Union (ESU), The Deliberative Classroom is a project funded by the Department for Education (DfE) to support teachers to lead knowledge-based discussions and debates with students on topical issues relating to fundamental British Values, Citizenship and Equality. The Key Stage 3 resources will be published as six packs over 18 months with a first topic of Religious Freedom. 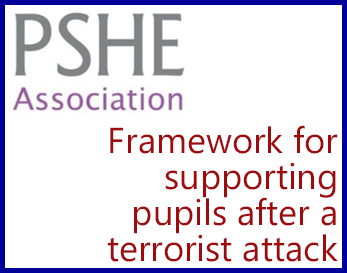 A series of four lesson plans for Key Stage 4 with a specific focus on addressing extremism and radicalisation of all kinds, from the PSHE Association, commissioned by Medway Public Health Directorate. Each lesson plan includes an accompanying Powerpoint presentation and relevant resources. The PSHE Association have guidance which can be used to support teachers in helping to answer questions and structure discussion with pupils who may be experiencing a wide range of emotions. The guidance is provided in versions to support both Primary and Secondary-age pupils and teachers can choose those elements that they feel are most relevant to the circumstances. 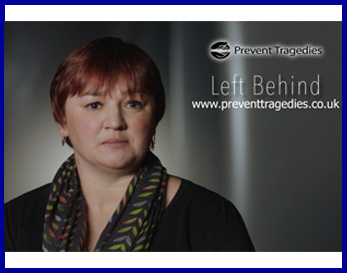 Prevent Tragedies has launched a short film that describes the devastation caused to families whose loved ones have travelled or attempted to travel to a conflict zone, like Syria. Left Behind focuses on the accounts of four police Prevent contact officers who have supported families from across the country and witnessed first hand the anguish they go through as a consequence of a family member's actions. Online e-learning resource aimed at those with responsibilities under the Prevent duty, particularly front line staff in schools and colleges. Designed to help raise awareness of radicalisation and support staff to identify the signs that someone may be at risk and where to go for support. The SWGfL 360 Safe Self Review resource has been updated to include related aspects of radicalisation and extremism and provides a freely available tool for schools to self assess and benchmark their Online Safety provision. There is increasingly widespread recognition that terrorist and extremist organisations are utilising the Internet and Social Media for the radicalisation and grooming of Young People. Further to this, the Department for Education and the Home Office have issued the joint enclosed briefing note (see link above) for schools highlighting some of these aspects and actions schools should take. Statutory guidance for specified authorities issued by HM Govt on the duty in the Counter-Terrorism and Security Act 2015. All specified authorities must have due regard to the need to prevent people from being drawn into terrorism. Issued March 2015 and revised July 2015. Departmental advice for schools from the DfE on promoting pupils’ Spiritual, Moral, Social and Cultural (SMSC) development, including what is expected of schools in promoting fundamental British values and how this aligns with schools’ duty to promote SMSC. A report commissioned by the DfE presenting the findings from a large-scale, in-depth research study into teaching methods – knowledge, skills, teaching practices and behaviours – that help to build resilience to extremism.